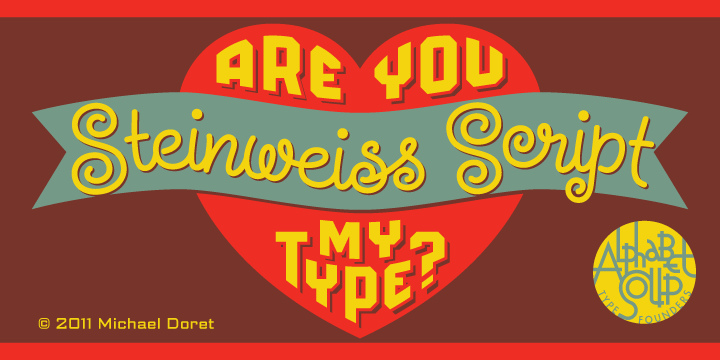 Alphabet Soup Blog » Blog Archive » Is Steinweiss Your Type? Pre-Valentine’s Sale! Is Steinweiss Your Type? Pre-Valentine’s Sale! Mark your iCals! The Steinweiss Script 20% off sale will begin on Tuesday, February 8th. Steinweiss is the perfect type for helping to pull you out of your shell, and getting you to express your most heartfelt sentiments. Available in Bold, Medium and Light, or all together as a loving Family. Just go to Alphabet Soup on (or after) February 8th to hook up. If you’d like to cozy up and get more familiar with Steinweiss before jumping into a serious relationship, read Steven Heller’s recent Imprint article. Steinweiss Script also features prominently in the lovingly composed interview I just did for Creative Characters.